When Laura (Emily Browning) storms over to Wednesday (Ian McShane) in “The Beguiling Man,” demanding a plan to rescue Shadow (Ricky Whittle) after his kidnapping at the end of the season premiere, Wednesday asks Laura to have faith in her man. But after driving with Mad Sweeney (Pablo Schreiber) to go after Shadow and literally running into a dead end, Laura gives up. She lays down in the field, creating a pretty picture of a beautiful dead woman in a graveyard (which the characters make sure to talk about, in case you miss the visual reference), and she needs Mad Sweeney to give her a pep talk to keep going. But I don’t believe for one second that Laura would give up looking for Shadow. And that’s the main issue with this episode of American Gods—it doesn’t make me believe. I don’t believe that Laura would give up so easily when the storytelling that came before shows she moves forward no matter the cost. She had a perfect plan to rob a casino and didn’t back down from believing in its perfection, even after her husband’s arrest and all that followed. She’s consistently used her newfound undead strength to force her way through any obstacle, so the end of a road doesn’t seem like it should be enough to stop her. I also don’t totally believe in Shadow’s relationship with his mom (Olunike Adeliyi). While it’s nice that American Gods is using flashbacks again, where so much of its lofty storytelling took place in Season One, these in particular weren’t effective. Young Shadow (Gabriel Darku) and his mother seem too sweet and too perfect, their interactions too clichéd. His mother’s only flaw is that she won’t reveal his father, and young Shadow’s only flaw is that he gets into a fight while trying to help someone. Both acts are meant to protect someone else, which only reinforces the characters’ goodness. 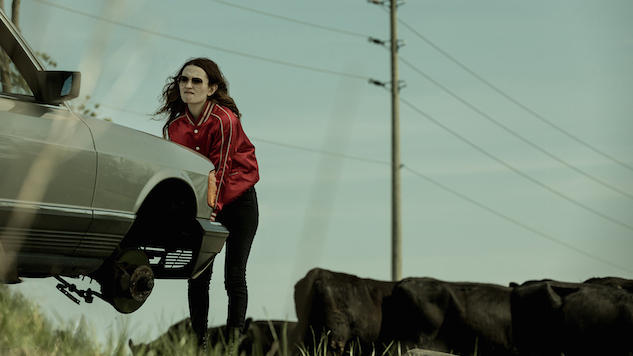 American Gods generally exposes the things that aren’t what they seem, so when there’s only one layer of storytelling in Shadow’s flashbacks—and when the characters in that story are one-dimensional—it doesn’t feel real. Instead, it feels full of plot points meant to trigger tears. A lot of “The Beguiling Man” is exposition heavy, with characters talking about what they need to do and why they need to do it. The flashbacks are one area where an exposition would have been fine: They try to show viewers Shadow’s background instead of telling about it, but a few sentences from Shadow describing how he ended up alone in the U.S. would have been preferable to scenes that beg for emotion without putting in the time to make viewers actually feel that emotion. The present-day Shadow spends the episode strung up in a torture machine, reminiscent of how Jesus was nailed to the cross. But it’s unclear why Shadow was taken, why he’s hooked into the machine, or what the machine actually does. Without knowing the stakes of his pain, the time spent watching him tortured feels wasted. Whittle does a good job with the scenes, looking hollowed out and haunted. But no matter how good the acting is, watching someone be tortured isn’t really a good time. Another thing that feels wasted is any time spent watching Laura and Mad Sweeney travel. If Mad Sweeney can apparently get anywhere he needs to go by traveling through his hoard—which looks like a scary version of Harry Potter’s apparating—why hasn’t he been doing that all along? It’s just another thing in the episode that feels like it doesn’t fit into the kind of story that American Gods has been telling. It feels like an unearned shortcut—because that’s exactly what it is. The episode ends better than it begins, though it did make me wish the whole episode had been a train heist instead of just a few minutes at the end. The action of Laura and Mad Sweeney rescuing Shadow feels more urgent and more fun than the diner, or Laura and Mad Sweeney driving, or even Technical Boy (Bruce Langley) looking for Media. The earlier scenes are full of a lot of talking and exposition—which is pretty much all Technical Boy can do while he looks for Media. That stakes aren’t entirely clear on that storyline, either: Mr. World (Crispin Glover) has sent Technical Boy to look for his best soldier to prepare for the war—but what happens if Technical Boy can’t find her? He says that he’ll become obsolete, but I’m not sure the show has invested enough in Technical Boy to make viewers care about his fate. (That’s not a dig on Langley, who plays Technical Boy with excellent dirt-bagginess.) If he and Media don’t come back, it’s a blow to the bad guys, but it doesn’t seem like much would actually change. It’s only the second episode in the new season, so hopefully American Gods finds its way back to meaningful storytelling. But after this episode, I’m starting to lose faith. Read our reviews of American Gods here.